Equipment organised at KiCE’s yard. 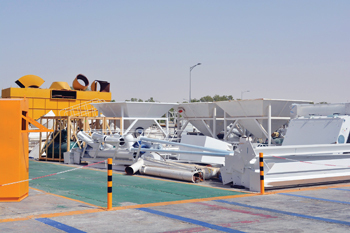 KiCE Construction Equipment, a leading manufacturer of batching plant and its components, has installed a new shearing machine to speed up production at its factory in Hasa, in the Eastern Province of Saudi Arabia. The company says it has seen a significant increase in production since adding the machine to shear metal used in the manufacture of batching plant and the spare parts. The programmable shearing machine provides accurate cuts from various thicknesses of metal and a low fixed rake reduces the amount of distortion during cutting. “We are continuing to invest in new equipment to streamline and improve our manufacturing process to meet customer demands for concrete construction equipment,” says Saleh Al Katheer, the CEO of KiCE. In addition, KiCE has also successfully completed operational enhancements to achieve greater batching plant fabrication efficiencies. It has organised its finished goods yard in which the manufactured parts and various types of batching plants will be placed in specific areas with divider lines for each product. “We were able to achieve the right balance between the manufacturing and finished goods process. This has allowed KiCE to maintain short, consistent lead times and strong delivery performance throughout the facility upgrade process,” says Al Katheer. Al Katheer says credit goes to the hard working teams in KiCE’s manufacturing and planning division who ensured these major improvements went smoothly during a challenging year. KiCE leads the way in supplying its high quality products backed by superior service support to its customers. The company recently boosted its portfolio with the addition of products from China-based Sinomach Heavy Industry Corporation. As the exclusive distributor in Saudi Arabia for Sinomach, KiCE will sell its products including its mobile cranes and wheel loaders across the kingdom. Sinomach’s wheel loader model 9126 is claimed to be the biggest of its kind in China. Its loader factory, which has advanced mechanical production technology, supplies boom and axles for Komatsu and Hyundai. Its mobile cranes have been co-designed with Terex and have the same parameters and settings as the Terex toplift series. They come in two series – TTCO55G and TTCO70G, said the company. The company also has a partnership agreement with Fujian Snowman Company to market, sell and support its Snowkey concrete cooling systems in Saudi Arabia. In addition, it markets and distributes Junjin pumps – mobile or static in lengths from 25 to 63 m – in the Gulf and represents the Truemax Company of China, which provides tower cranes, placing booms and dust control systems. Meanwhile, in line with growing environmental concerns in the region, KiCE offers solutions to batching plant factories located in residential areas in Al Hasa. “The main idea is to install environment-friendly batching plants to prevent water and air pollution in the factory and the surrounding environment by placing filters, following up with regular maintenance and planting trees inside and outside the factory area,” Al Katheer. Towards this end, KiCE addressed a meeting at the Hasa Chamber of Commerce recently, which was attended by Suleiman Bin Hassan Al Afaleq, chairman of concrete and blocks at Hasa Chamber and vice chairman of the National Committee of Ready-Mix Concrete, KiCE officials and executive managers from readymix suppliers.